Sprite or 7up, soy sauce, calamansi juice, garlic, ginger, onions, pepper and sugar. Marinating the chicken overnight will give you the best result. On your own, you have to carefully measure the following ingredients to avoid that awful taste. While roasting the chicken, don’t forget to brush its skin with butter, so it’ll look more delicious. After an hour or so of roasting, or until the skin of the chicken gets golden brown, you can now take the chicken off the heat and it is ready to be served! Enjoy! Marinate the whole chicken in Sprite or 7up, soy sauce, calamansi juice, garlic, ginger, onions, pepper and sugar for an hour or more. To get the best result we suggest to marinate the chicken overnight. Stuffed the Chicken cavity with the following lemon grass tied together, garlic, bay leaves and Peppers. Inject the marinade mix unto the inside of the chicken. Rub the chicken’s skin with butter, salt, pepper and garlic. 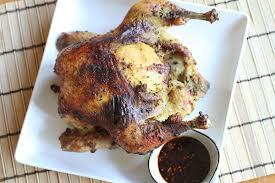 Finally, roast the chicken for 1 hour and 20 minutes or until the chicken is golden brown. Serve hot with Mang Tomas lechon sauce.